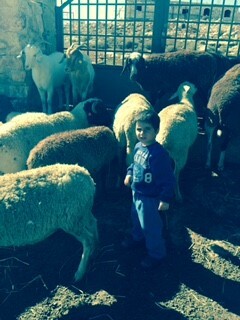 Tzur Ye’elim Khan, an educational-agricultural farm, is located in south-eastern Gush Etzion, on the edge of the Judean desert. It was established by two partners who share the dream of settling the Land of Israel. The farm is spread over 250 dunams with another 17,000 dunams for grazing. It sits at an altitude of 850m above sea level, and looks out over the Dead Sea to the east and the Judean hills to the west. Visitors ascending the path leading to the khan are met by the sight of Wadi Arugot, the Judean desert, and the open blue sky. The accommodations at the khan include 15 rooms built around a large courtyard that allows for diverse activities, including outdoor camping. There are also rooms for indoor activities, such as music or yoga workshops etc. There is an olive grove, vineyards, and a sheep farm. An events hall is planned to open in the near future. The site is open to tourists, educational groups, and families, from Israel and abroad. The farm was established on state land in a unique region of the country in order to strengthen the Jewish presence in the area. The existence of the khan and its ongoing activity serves to establish Jewish ownership, while serving as an attraction that draws visitors from near and far, making this region accessible and familiar to them. 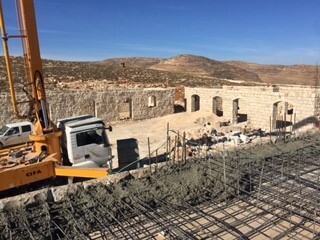 The founders have invested all the necessary funds for development, including construction of the khan, connections to infrastructure, planting the trees, and purchasing the flock of sheep. The site is now in need of aid for security purposes, to protect the property and the visitors.